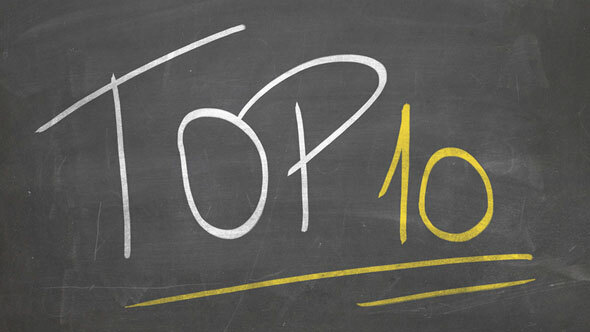 2.Top 10’s Three Horsemen of Bull Market. 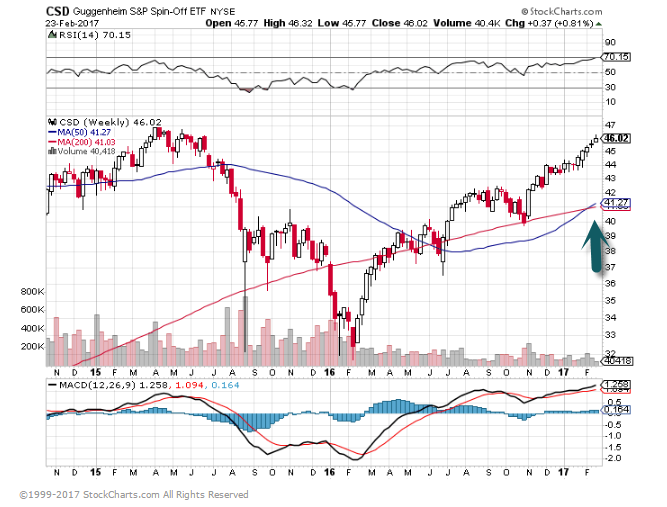 The Biggest Horse Still Making New Highs…Buybacks. 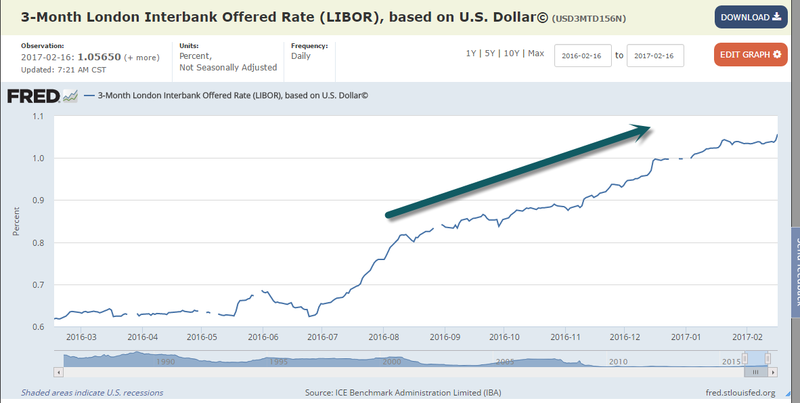 +13% Since Election…No Negative Effect of Rate Rise? Spin-Offs Not at New Highs Yet…50day thru 200day to Upside. 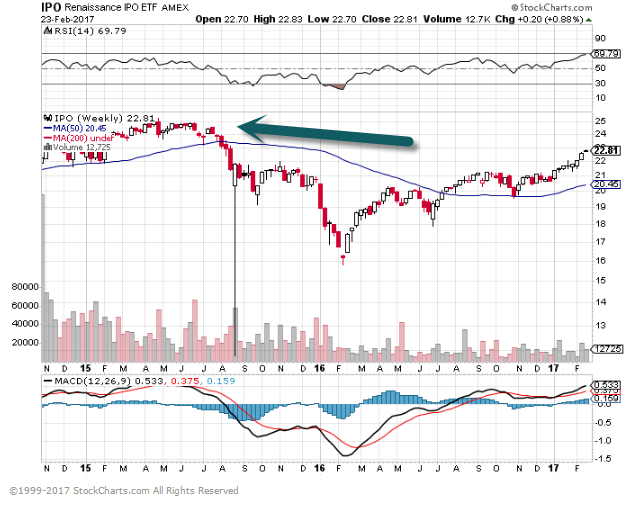 IPO ETF Lagging…No New Highs..Private Equity Buying Up Potential IPOs? 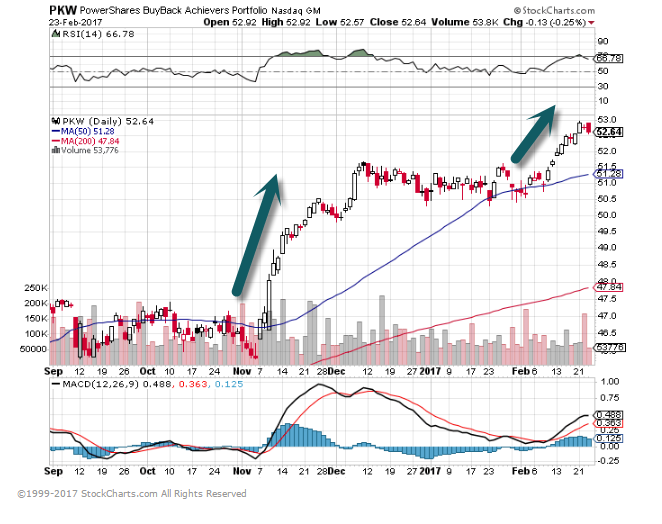 3.Energy Pulling Back Despite Positive Global Economic Data. A persistent global glut of oil that has dogged markets for around two years may never truly subside, says one industry expert. According to Spencer Dale, chief economist at oil giant BP PLC BP., -0.48% BP, +1.35% the global oil market suffers from an abundance of oil that’s going to add pressure on the industry for decades. 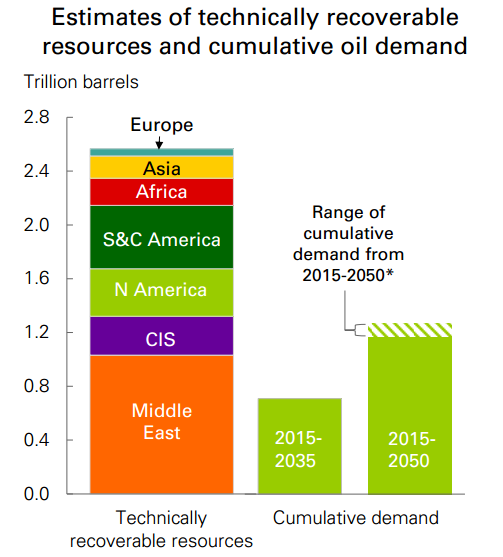 As this chart shows, BP estimates that there are about 2.5 trillion barrels of technically recoverable oil resources left in the world, enough to cover the world’s entire oil demand out to 2050—twice. “This is my killer chart. It’s very simple, very straight forward, but it makes a very powerful point,” Dale said, when presenting BP’s 2017 Energy Outlook to delegates at the International Petroleum Week in London on Wednesday. 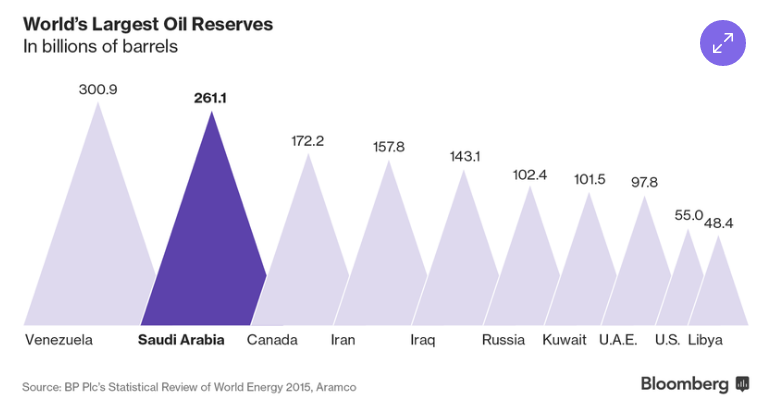 “It seems to me increasingly likely that some barrels of technically recoverable oil will never be extracted, there’s just so much oil. Why does that matter? This matters because it could profoundly change the nature of oil markets,” he added. 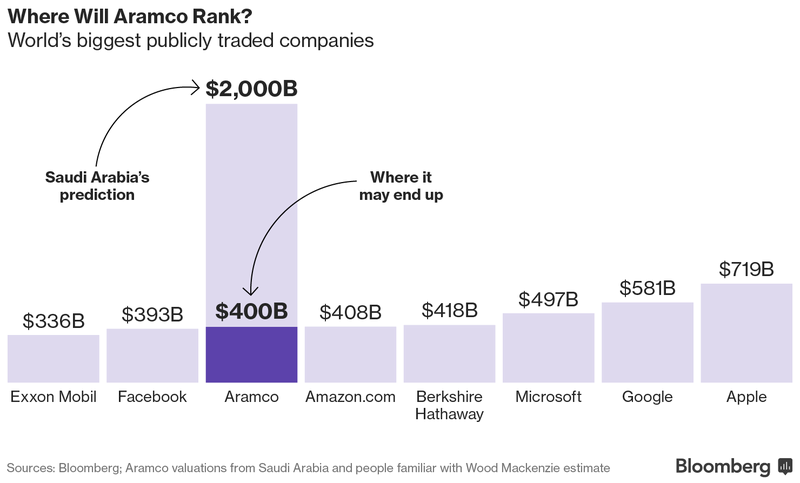 4.As Supply and Demand Debate Continues, Saudi Aramco is Planning Massive IPO. Saudi Arabia has said oil giant Saudi Aramco is worth more than $2 trillion, enough to consume Apple Inc. twice, and still have room for Google parent Alphabet Inc.
Industry executives, analysts and investors told Bloomberg their analysis — based on oil reserves and cash flow projections under different tax scenarios — suggests Aramco is worth no more than half, and maybe as little as a fifth, of that amount. This means Saudi Arabia would earn a fraction of the $100 billion implied by its valuation if it sells 5 percent to the public in 2018, as planned. 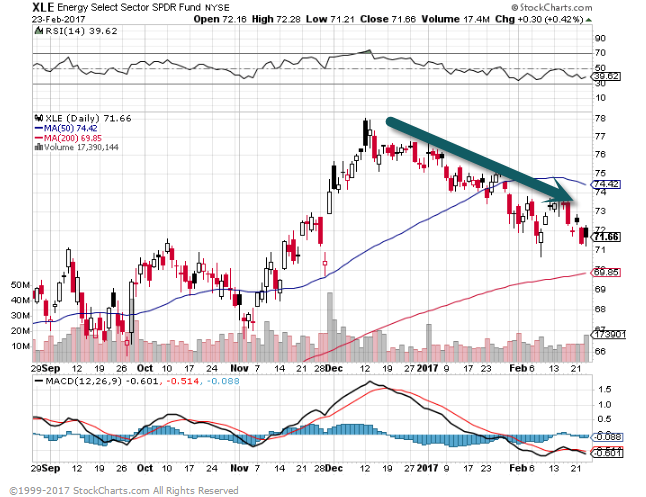 5.Existing Home Sales Hit 10 Year High…..Homebuilder Stocks 2012-2017 Range. 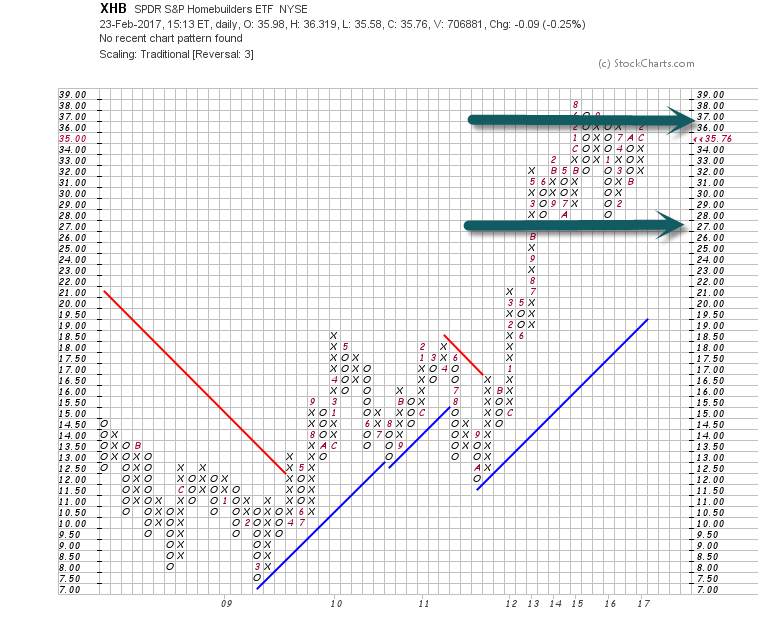 XHB Homebuilder ETF…2012-2017 Range Bound. 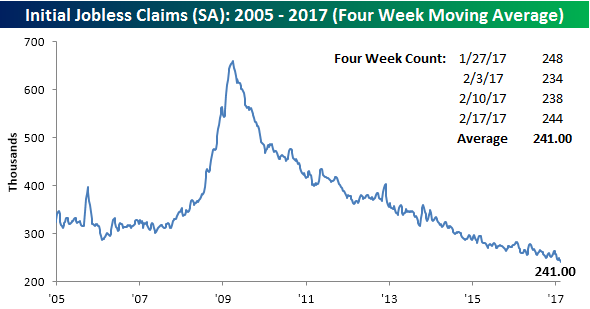 Jobless claims for the latest week came in slightly higher than expected Thursday morning, rising from 238K up to 244K, which was 4K above the consensus estimate of 240K. 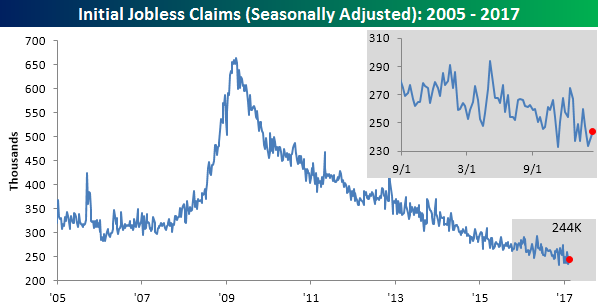 There’s not much new here in the headline number; jobless claims remain exceptionally low by historical standards and have now been below 300K for 103 weeks. 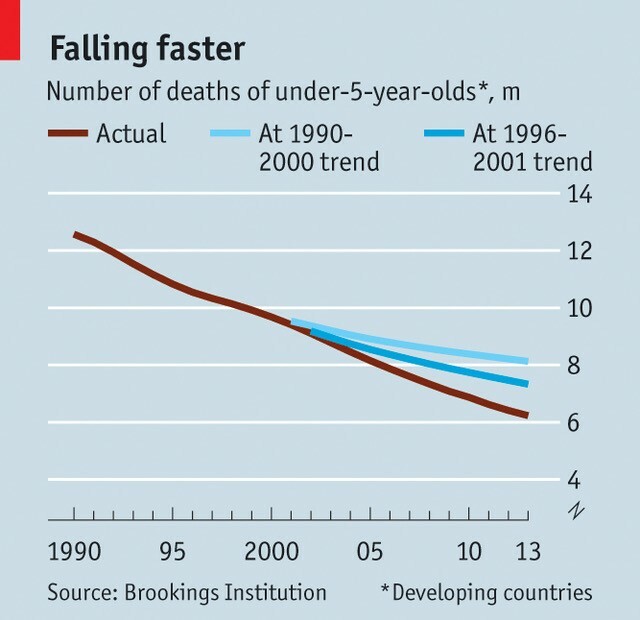 That’s the longest streak since 1970 – a time when the US population was a lot larger than it is now. Even with the increase in the weekly print, the four-week moving average dropped by over 3K, falling to 241K. That’s a new post-recession low and a level that hasn’t been seen since 1973. 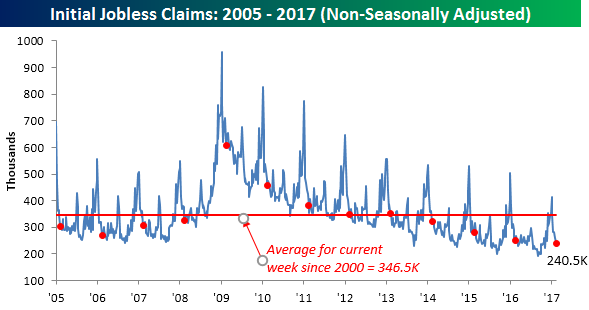 On a non-seasonally adjusted basis, claims were also solid, falling from 245.9K down to 240.5K. For the current week of the year, this is more than 100K below the average level since 2000 and is the lowest level for the current week going back to 1969. 7.Deflation in Europe is Dead. 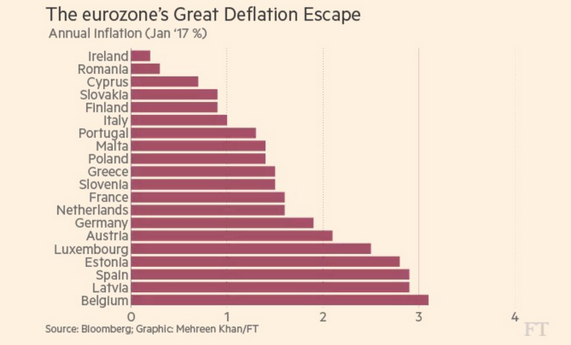 The Eurozone: At this point, all Eurozone members are out of deflation, although there is quite a bit of variation (note that for some reason the FT also included Romania and Poland but excluded Lithuania). 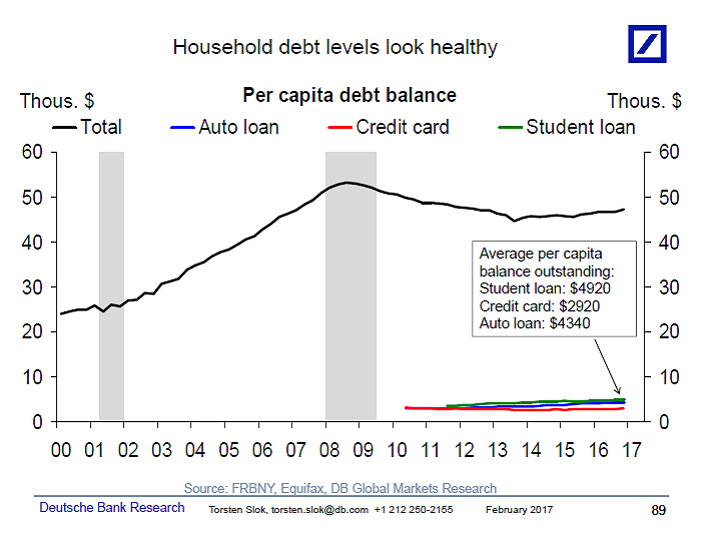 Per capita debt levels have moved essentially sideways over the past decade, see chart below, and student loan, auto loan, and credit card balances are all very low compared with mortgage debt levels. For example, student loan balances currently stand at $4920 per capita; this compares with around $34000 per capita in mortgage debt. Put differently, for household debt to be a macro problem we will need another big nationwide decline in home prices. 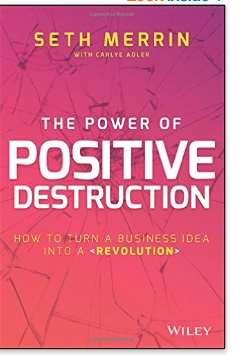 The Power Of Positive Destruction is an amazing book. Firstly, because Seth Merrin, who created the first electronic order management system to automate equity trade management, walks the reader through his businesses successes and failure, analyzes what worked and what didn’t and often draws some broad lessons from his experience. Merrin’s first big step in automation was to alphabetize the binder, which was seen as a big innovation. As a student at Tufts he had majored in political science and taken courses in art history, Byzantine history and Yiddish literature, plus one in bonds and stock, where he did well, and another in computers — not so much. Still it was enough that when he joined a risk-arbitration group at Oppenheimer, he knew there had to be a better way to monitor positions than to erase the old number in the ledger and pencil in the new figure. Using a Tandy Radio Shack computer which was ignored in a corner, he learned an early spreadsheet, Multiplan, and showed he could do updates in real-time so trades could be done much faster. He became a consultant, and grew his consulting gigs into an order management system, delivered just 18 months late. It wasn’t the last missed deadline in his career, but it did so well at handling trades that even in the 1987 crash, shortly after he finished, no client gave it up, although new sales stopped for months. After seven years of Merrin Financial’s success, Microsoft introduced Windows, and just to confuse software application developers, IBM launched OS/2 at the same time. Which to build on? New competitors entered the OMS business on the Windows platform and with no DOS legacy to support, they were able to develop quickly. It took Merrin three years to develop a Windows platform and another three years to get the bugs out while profitability went to zero. He suggests having one or two people assigned to looking into the future to anticipate development. Merrin sold his company to ADP and looked around for what to do next, including a stint in Silicon Valley where he worked on a health-tech startup that was technically strong but maybe launching into the wrong industry. A venture capitalist offered some advice. The book offers some general lessons — find the two or three things the client is most concerned about or provide the most value. Get an edge in your business by showing a way to do it faster, better or more efficiently. Look for problems that others think are just the cost of doing business. Seth’s OMS met many of these — it let firms scale assets without adding head count, not to mention it reduced errors. His time in California was valuable — the coast was years ahead of New York in peer-to-peer computing and in organizing startups with elegant user interfaces, in compensation that included options to provide a stake in the company for employees, and in casual offices. Merrin’s idea was for an anonymous block-trading pool for large block orders open to asset managers only; they wanted the sell-side kept out because they didn’t trust the brokers. His stroke of genius was realizing that the OMS systems could provide liquidity for a dark pool without requiring the complexity in development or user training that had sunk Optimark. The aim was to eliminate the way large purchases moved the market prices, even when broken up into small orders by algorithms. The price movements cost asset managers an estimated $100 billion a year back when the institutional market was valued in hundreds of billions, and commissions to brokers cost billions more. Today the institutional market is $15 trillion. Merrin notes that he was lucky to launch in March 2000 at a valuation of $85 million, a few months later he would have been lucky to get a $20 million valuation, he wrote. Get finance when you can, he advises, because the market mood can change quickly. Merrin advocates role playing ahead of negotiations. He advocates what he calls 3×3 — anticipate questions, develop three responses and prepare for three back and forth iterations of the discussion. Throughout the global financial crisis the company saw volumes and profits shrink. It cut staff and eliminated layers of management but continued investing in the future, especially in Asia Pac, over the objections of some board members. Coming out of the downturn he asked three of the five original board members to retire. Along the way he also learned a lot about how to hire, how to fire, how to choose board members, and the importance of building and maintaining a strong corporate culture. That involved learning that new hires from investment banks weren’t always a fit. Now the company has a rigorous hiring program, casual dress code, free snacks, a fridge that always has soft drinks and beer, and it has dumped all titles, except apparently for Merrin’s CEO. “Merrin and his late wife, Anne Hyman, believed in the Hebrew philosophy known as “Tikkun Olam,” which translates to the idea that all people have responsibility to repair the world. Together, they founded a village in Rwanda for orphans of the Rwandan genocide. The village provides more than 500 students housing, education, and health care for four years. When Anne died suddenly in 2014 in horseback-riding accident, about the time their children had moved out and they planned to step back from work and spend more time together, Merrin threw himself into work even more intensely, and into philanthropy. One of this first flights after Anne’s death was to Rwanda to assure everyone the village would continue, and he shared hugs with every child and staff member. With Carlye Adler, Merrin has created a valuable handbook for people building a company, and designing a life. 10.Leverage….Some Staggering Numbers on the Reduction in Poverty and Disease. 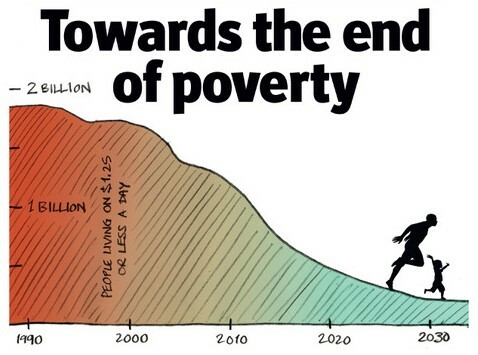 Bill: Extreme poverty has been cut in half over the last 25 years. That’s a big accomplishment that ought to make everyone more optimistic. But almost no one knows about it. 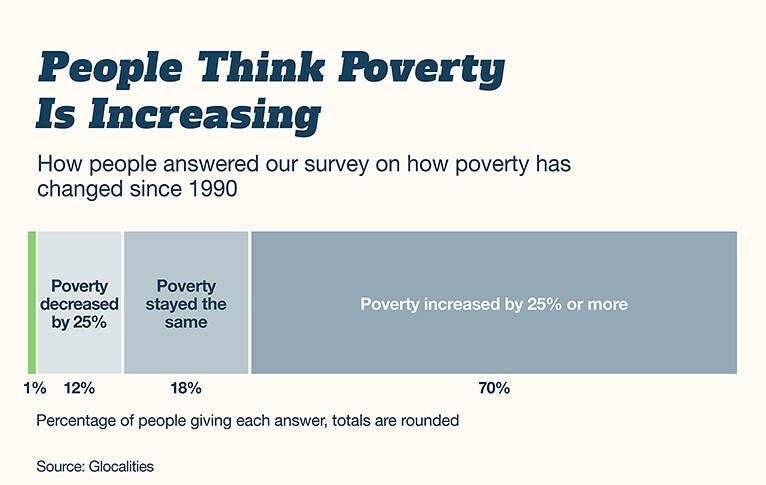 In a recent survey, just 1 percent knew we had cut extreme poverty in half, and 99 percent underestimated the progress. That survey wasn’t just testing knowledge; it was testing optimism—and the world didn’t score so well. Melinda: Optimism is a huge asset. We can always use more of it. But optimism isn’t a belief that things will automatically get better; it’s a conviction that we can make things better. We see this in you, Warren. Your success didn’t create your optimism; your optimism led to your success. It’s especially valuable to stay optimistic when you face disappointments, and we’ve had more than a few. We’re deeply disappointed we don’t have an HIV vaccine yet, or an effective microbicide: a cream women can use to block HIV infection. We were also hoping by now to have a stronger malaria vaccine. Bill: And we haven’t had advances in tuberculosis for a long time. We think we’re close to a fantastic new diagnostic, but we don’t have it yet. Researchers are making progress on a TB vaccine, but I wish we had one now. And the best causes always need more funding. 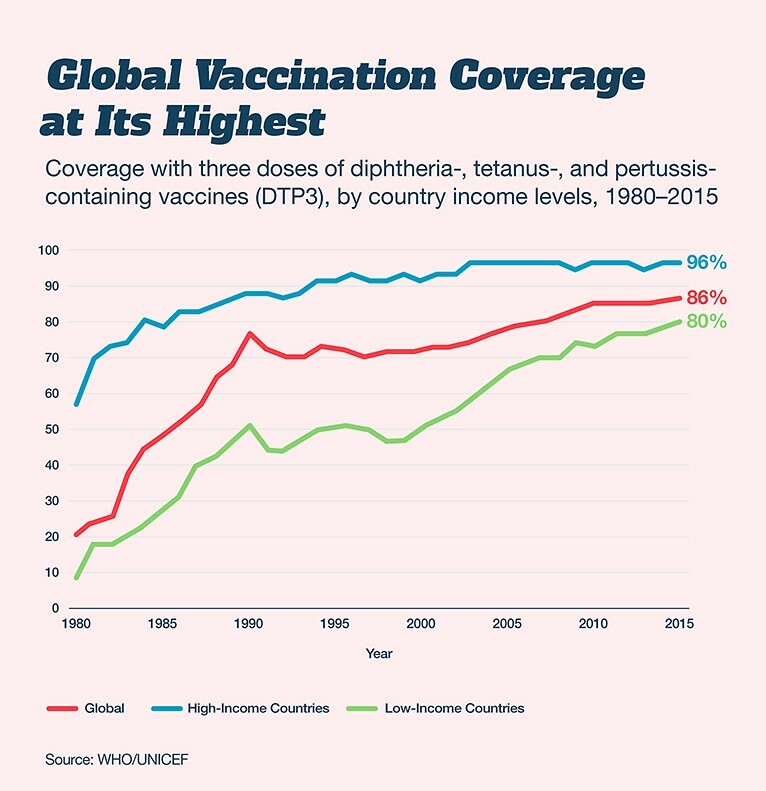 That’s why the 2008 financial crisis was such a huge setback for global health. We’d be getting much more aid from donor countries now if it had never happened. Melinda: But if you’re optimistic, disappointments are just disappointments. You don’t twist them into evidence that the world is getting worse. Bill: One of my favorite books is Steven Pinker’s The Better Angels of Our Nature. It shows how violence has dropped dramatically over time. That’s startling news to people, because they tend to think things are not improving as much as they are. Actually, in significant ways, the world is a better place to live than it has ever been. Global poverty is going down, childhood deaths are dropping, literacy is rising, the status of women and minorities around the world is improving. Melinda: A lot of people feel the world is getting more fragmented, and we all can point to examples of that. But if you look along a timeline, the periods of fragmentation often come when society is digesting its new diversity. 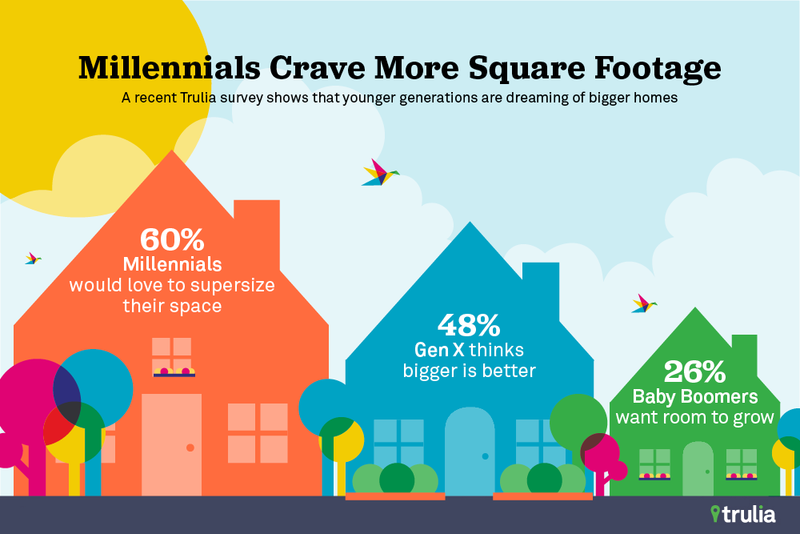 The larger historical trends are toward greater inclusion and caring. We definitely see it in global health. Governments are prioritizing it. Citizens are supporting it. And scientists are migrating to it. Bill: Warren, this commitment to global health is driven by empathy—the same impulse that made you decide to give your wealth back to society. Melinda: We’re trying to channel your empathy, add your optimism, mix in technology, apply strategy, and work with partners to save more lives. That’s how we’re spending your gift. Bill: It won’t surprise you to know that we’re more optimistic than ever. Melinda: And more impatient too.